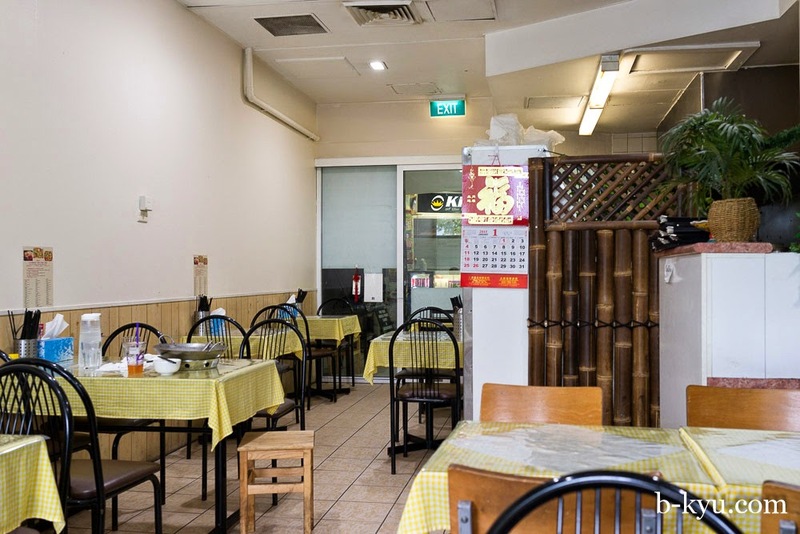 There's a mighty big blast of Sichuan heat and flash coming from a small shop in Chatswood. Tasty Bites serves up food with a fiery focus and a touch of homestyle in the cooking. The small arcade near the Orchard Tavern just off the top of Victoria Avenue is a mixed bag of shoe repairs, tobacco shops and a small resto or two. Tasty Bites is about half way down, with an entrance and some sheltered tables either inside the narrow mall or an outside door with a wall full of colour menu photos. If the pictures don't entice you to come in, the smell of Sichuan pepper and chillis frying and popping inside will. The vegetable dishes here aren't just veggies, there's often a bit of pork lurking in there somewhere for extra flavour. This stir fried cauliflower with garlic bolts ($12) was a lovely golden barbeque colour and had a firm bite with loads of garlic and slices of ham, or a ham type substance. Garlic bolts turn out to be green shoots, while dried chilli gives a flavour edge and a little bite. Sauce lurks beneath the bamboo mat cauliflower safety net. Chef's special smoked duck $18. The smoky salty flavours of this dish reminded us of ham, it's like the love child of Porky Pig and Daisy Duck. The fattier bits were extra strong, almost too much. There was plenty for two, we took some home. 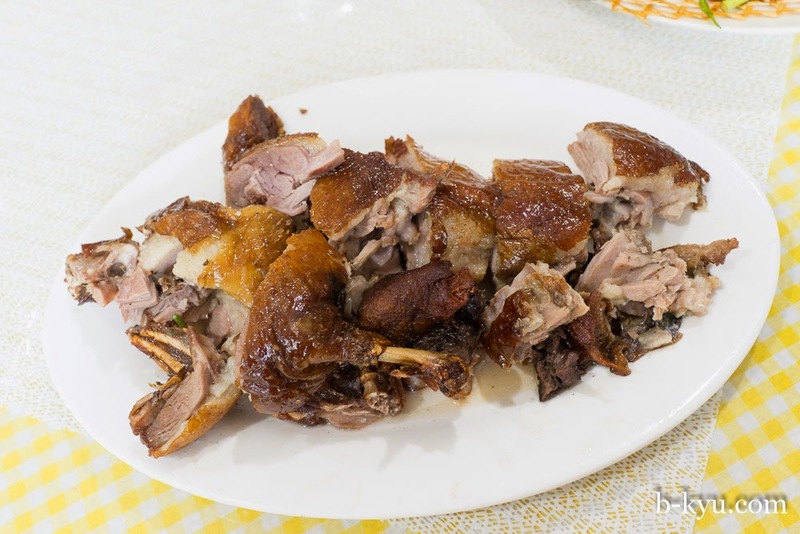 We especially enjoyed the the look of pride on our servers face when she brought out the duck, this dish sure is special. 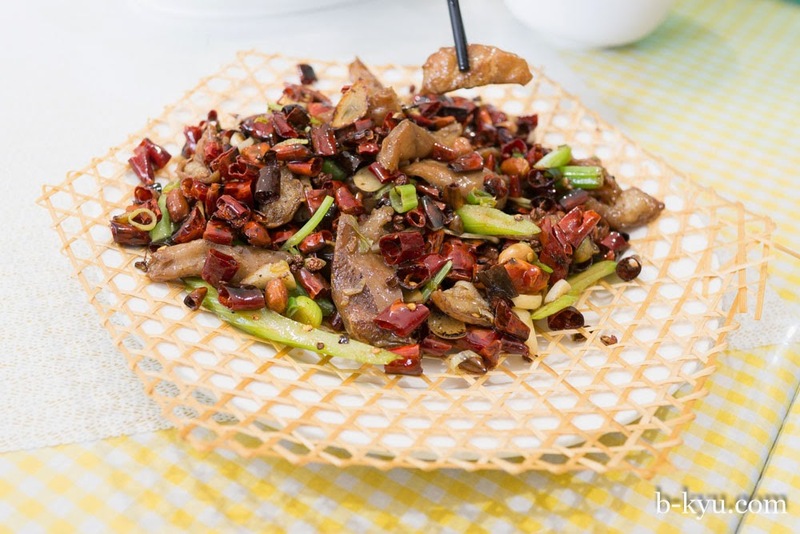 Stir fried bacon with tea-tree mushroom - about $15. We wondered what the 'bacon' would be, it turned out to be bacon, without the smarmy inverted commas. Little bits of bacon stir fried with celery and capsicum and those lovely tea tea mushrooms, and a bit of chilli to boot. It's a light and lively dish. 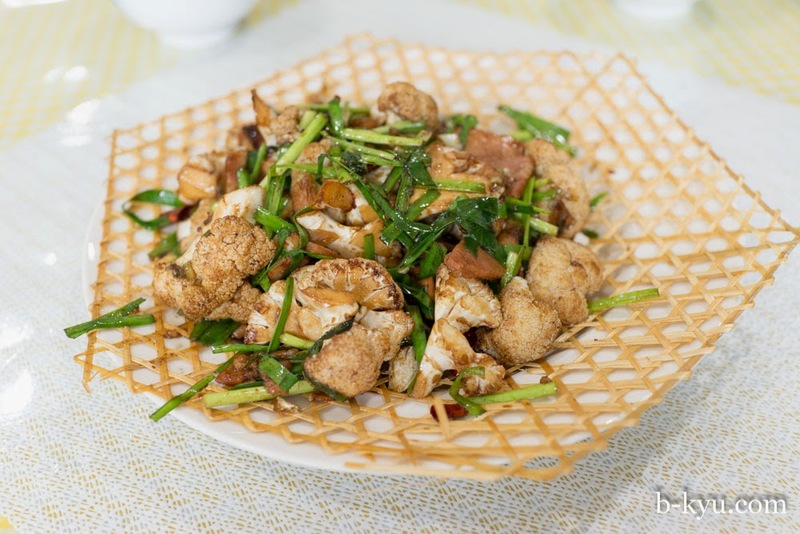 Crisp marinated intestine tossed with garlic, ginger, peanuts & dry chilli. About $14. Shawn doesn't usually like offal but he likes intestines when the flavour is masked a bit so Alison got her way with this order. In this dish the intestines still tasted a bit funky but it worked well amongst the strong flavours of garlic, chilli and ginger. There were some little extra crispy bits that were especially good. 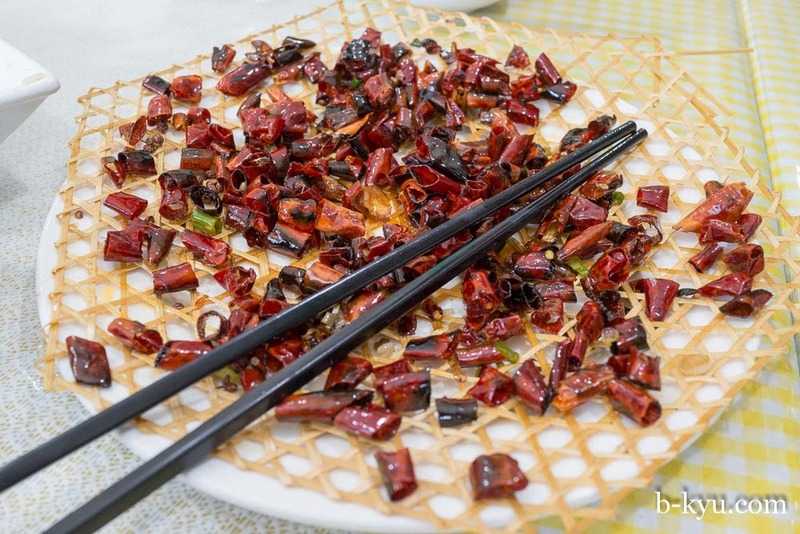 Half the fun of this food is picking the very last bits of peanut and crunchy fried Sichuan pepper from the red sea of dry chilli. Similar to the ending of a meal at Masterbowl. Duck gizzard with capsicum salad $4.5 (small). 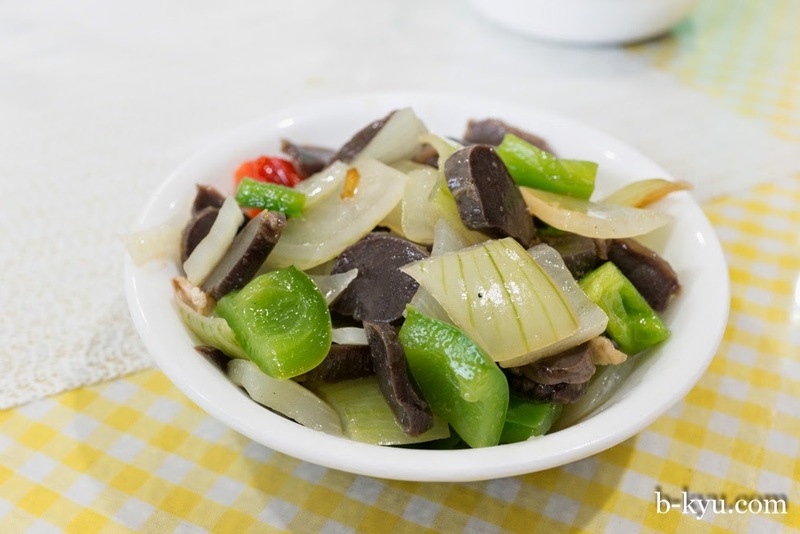 The gizzards are compressed in texture and mild in flavour, served cool with capsicum and onion that must be slightly pickled to take the sting out. 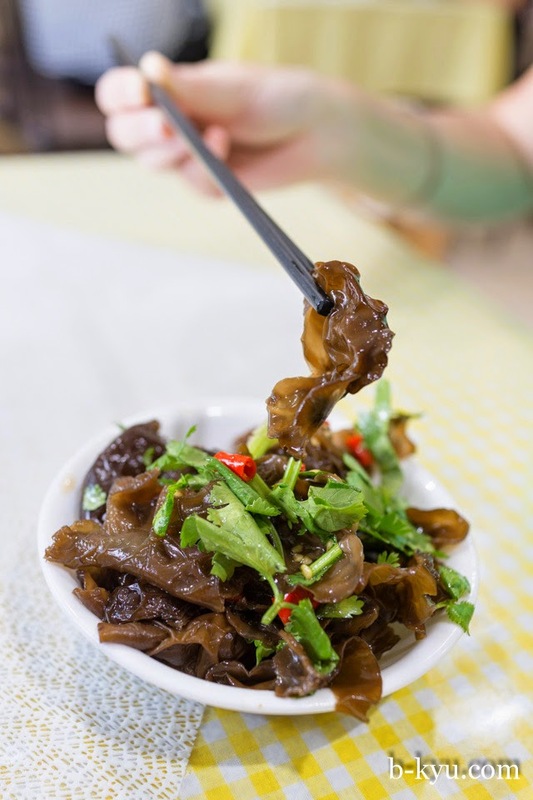 Black fungus with coriander - $5 (small). 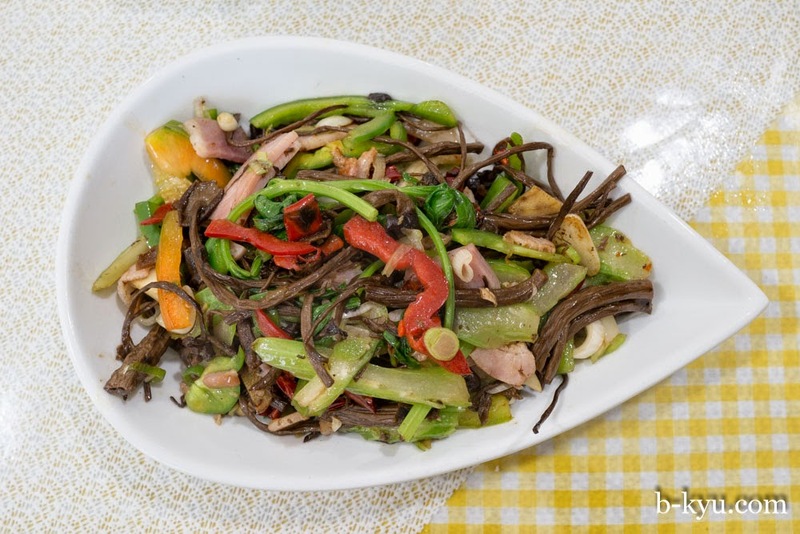 The mild flavour of black fungus and it's light bitey texture go well with fresh coriander and a good fresh chilli wallop. 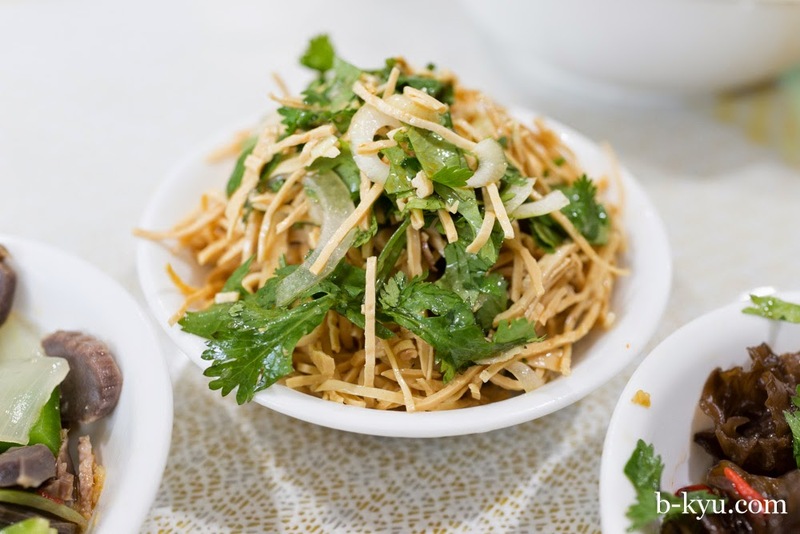 Mixed beancurd shreds - $3. This is a dish essential for cooling the mouth after extended bouts of chilli munching. Noodles with sesame paste (dan dan mian) $8.80. 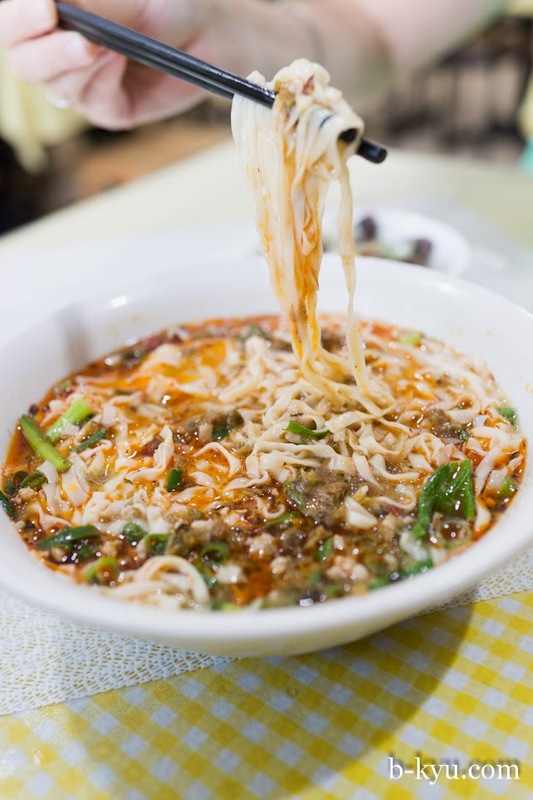 A classic dish of Chengdu, this version is served soupy and chilli flavoured and with a good mouth tingle from the peppers. 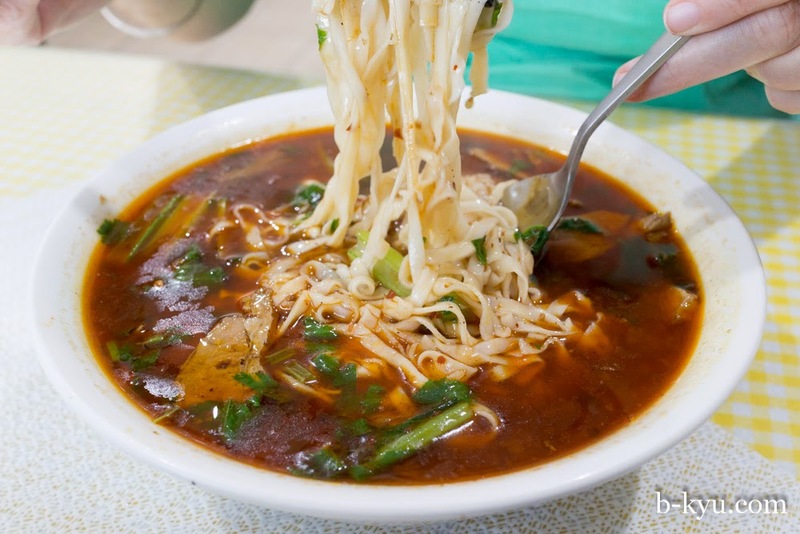 The broth is a little cloudy from the sesame paste and a small sprinkle of minced pork adds some additional flavour. Steam boat flavour hot and spicy beef noodle soup - $8.80. A big hearty bowl of noodles served at a scalding temperature. There's a slick of oil along the top that keeps the temperature high and the soup itself has a kick that turns up the heat. Stuff face with mixed beancurd shreds in between mouthfuls for a cooling break. 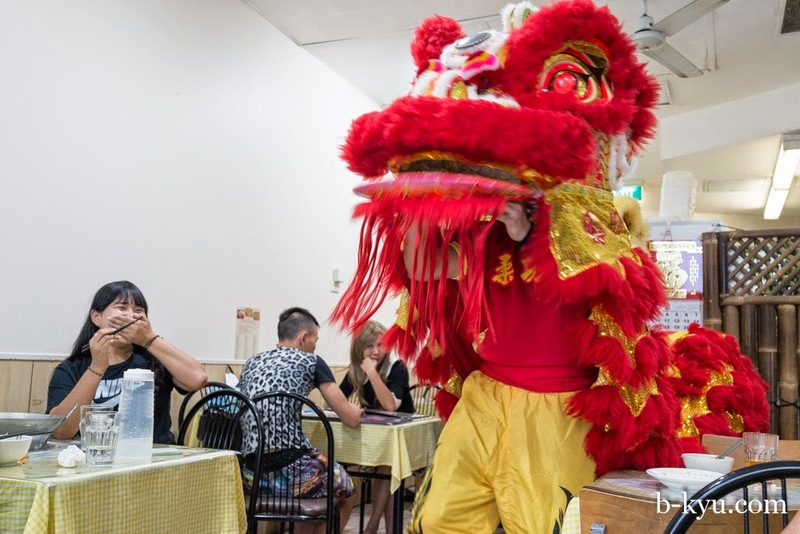 The Chinese New Year Dragon drops in for fried rice. 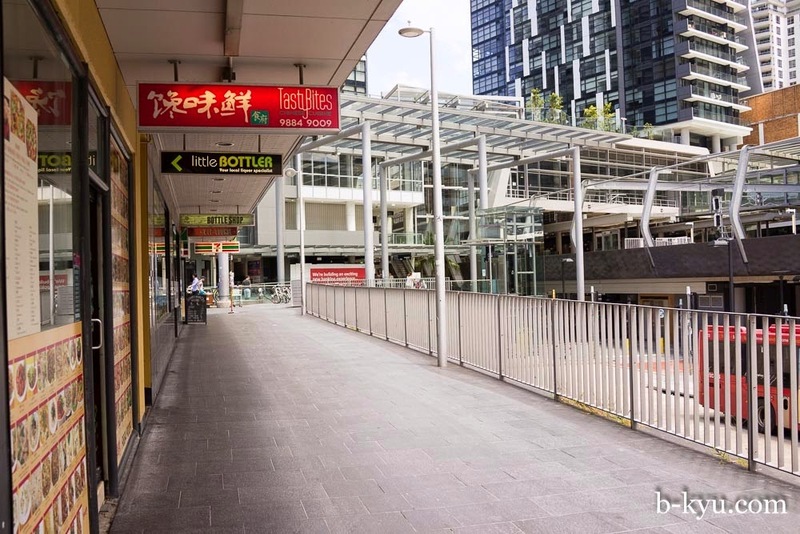 Tasty Bites is at Orchard Centre, 455 Victoria Avenue , Chatswood.